Black holes do indeed come in three sizes: small, medium and extra large, a new study suggests. Astronomers have studied many black holes at either size extreme — "stellar-mass" black holes, which are a few dozen times as weighty as the sun, and supermassive black holes, which can contain millions or billions of times the mass of the sun and lurk at the heart of most, if not all, galaxies. But that debate can now be put to rest, says a research team that has measured an intermediate black hole's mass with unprecedented precision. 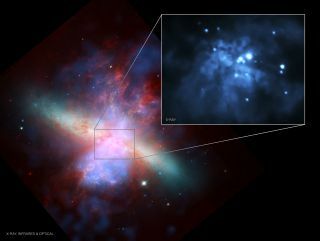 A black hole in the nearby galaxy M82 weighs in at 428 solar masses, give or take a hundred suns or so, they report today (Aug. 17) in the journal Nature. "Objects in this range are the least expected of all black holes," study co-author Richard Mushotzky, an astronomy professor at the University of Maryland, said in a statement. "Astronomers have been asking, 'Do these objects exist, or do they not exist? What are their properties?' Until now, we have not had the data to answer these questions." Black holes famously gobble up anything that gets too close, including light. But that doesn't mean astronomers can't see them; bright X-ray light streams from the superhot disk of material spiraling into a black hole's mouth. About 15 years ago, NASA's Chandra X-ray Observatory spacecraft spotted such emissions coming from a source in the galaxy M82, which lies about 12 million light-years away from Earth. For a long time, Mushotzky and some other scientists suspected that the object, called M82 X-1, was a medium-size black hole. But those suspicions were tough to confirm. "For reasons that are very hard to understand, these objects have resisted standard measurement techniques," Mushotzky said. In the new study, a team led by University of Maryland doctoral student Dheeraj Pasham took a closer look at M82 X-1. They studied observations made from 2004 to 2010 by NASA's Rossi X-ray Timing Explorer (RXTE) satellite, which ceased operations in 2012. The RXTE data revealed a pair of repeating oscillations in M82 X-1's X-ray emissions. These oscillations occurred 5.1 times per second and 3.3 times per second, respectively — a ratio of three to two. This fact allowed the team to determine the black hole's mass. "In essence, [the] frequency of these 3:2 ratio oscillations scales inverse[ly] with black hole mass," Pasham told Space.com via email. "Simply put, if the black hole is small, the orbital periods at the innermost circular orbit are shorter, but if the black hole is big, the orbital periods are longer (smaller frequencies)." The researchers calculated M82 X-1's mass at 428 suns, plus or minus 105 solar masses. "In our opinion, and as the paper's referees seem to agree, this is the most accurate mass measurement of an intermediate-mass black hole to date," Pasham said. Confirming the existence of intermediate black holes could help researchers better understand the supermassive monsters at the cores of galaxies. Such behemoths apparently first formed in the universe's very early days, just a few hundred million years after the Big Bang. They could not have grown so big so fast if their "seeds" were small stellar-mass black holes (which result from the collapse of giant stars), Pasham said. "Many theories, therefore, have suggested that these initial seed black holes had to have been a few 100 -1,000 times our sun," he said. "But we did not have firm evidence for such intermediate-mass black holes." Stellar-mass black holes also often feature paired X-ray oscillations that occur in a 3:2 frequency ratio. Therefore, the new observations suggest that medium-size black holes may behave like scaled-up versions of stellar-mass black hole systems, Pasham added. The research is detailed in the Aug. 17 edition of the journal Nature.